JL Audio built the BassWedge JL Audio CP110-W0v3 enclosure to make car-rattling bass for a reasonable price, without the need for a ton of power. The enclosure’s designed to match the 10″ sub loaded into it, so you know you’ll get every ounce of performance out of this enclosure. 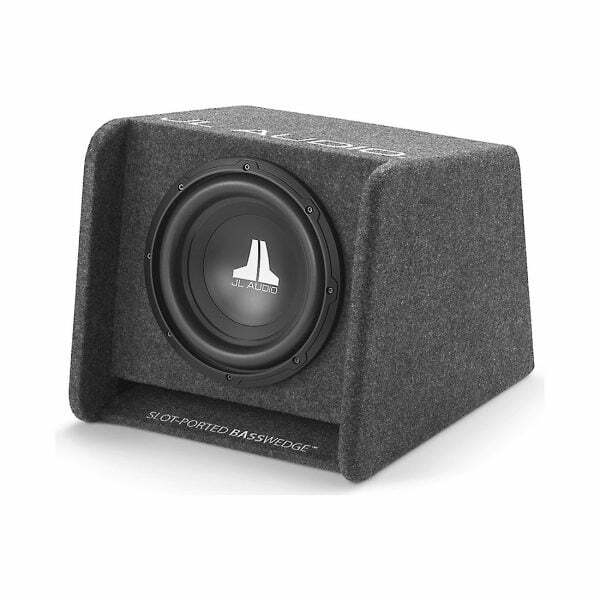 The JL Audio CP110-W0v3 BassWedge contains one 10″ W0v3 subwoofer that handles up to 300 watts RMS, and is loaded into a specially built slot-ported enclosure. The enclosure can be placed with the woofer firing downwards, or in typical front or rear firing applications, giving you immense bass regardless of how you place it. 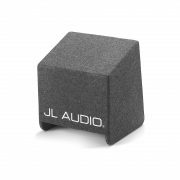 Overview: The JL Audio slot-ported BassWedge subwoofer enclosure is designed around JL Audio CP110-W0v3 10″ (4Ω) subwoofer. Aggressive tuning delivers powerful bass without the need for a huge amplifier. The MDF enclosure is covered with gray carpet and has JL AUDIO logos embroidered across the top and front. The enclosure design offers a variety of installation options: forward, rear or down firing. The slot-port runs along the bottom of the enclosure and fires on the same plane as the woofer; the port mouth is flared to minimize air-flow noises. Dynamic Motor Analysis (DMA): DMA is JL Audio’s proprietary method of improving dynamic motor behavior. As a result of DMA optimization, the 10W0v3-4 motor displays linear force over a long excursion range, and also maintains a stable fixed magnetic field in the gap over a wide power range. The result is a reduced distortion, faithfully reproduced transients, and tight, clean, articulate bass. Elevated Frame Cooling: The elevated frame design of the 10W0v3-4 delivers cool air through slots directly above the top plate to the voice coil. This not only enhances power handling, but also sound quality by minimizing dynamic parameter shifts and power compression. Optional Grille: The optional SGRU-10 grille (item number 136SGR1031, sold separately) can be added to protect the woofer cone. 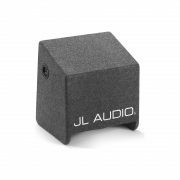 Dimensions: The JL AudioCP110-W0v3 enclosure isn’t symmetrical; it’s approximately 15-5/8″ wide, 14″ tall at its tallest point (toward the front), 12″ tall at its shortest point (toward the back), 17-5/8″ deep at the base, and 13-5/8″ deep at the top.